I need to do a quick edit--You can probably hear the clapping--I just went to enter at Cupcake Craft Challenges and found out I was picked for 1st place on my Bicycle card--Yay!! What a fun way to add to stash. I'm trying to use things that I have had for quite some time, so you'll probably be seeing stamps you might have forgotten were around. 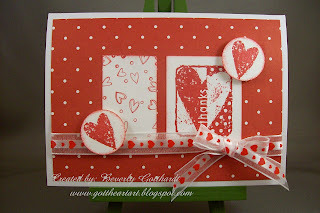 Supplies: White Card Blank 4" X 5 1/2" The Paper Studio, Papers: Stampin Up-Whisper White, Patterns Pack III, Stamps: Stampin Up-Sprinkles, Simply the Best, Ink: Stampin Up-Riding Hood Red, Stampin Up-1" circle punch, ribbon-Michael's, pop dots. Fun, fun, fun!!! I like the way you used stamps to create your own PP and also on each shape in the sketch. Happy to see you playing along with us at Sketch Girl!!! Fun card! Congrats on winning! Thanks for joining us at Sketch Girl! Congrats on your win! I love your take on the Sketch Girl sketch! Thanks for playing with us! This is great Beverley and well done on winning too!! Thanks for joining us here at OSAAT and good luck in all the challenges too. Awesome card! keep up th eawesome work!!!! Thankyou for joining us here at OSAAT. Very cute, thanks for playing along with us at Sketch Girl!